Who Was Kurmanjan Datka And What Does She Mean To The Kyrgyz People? 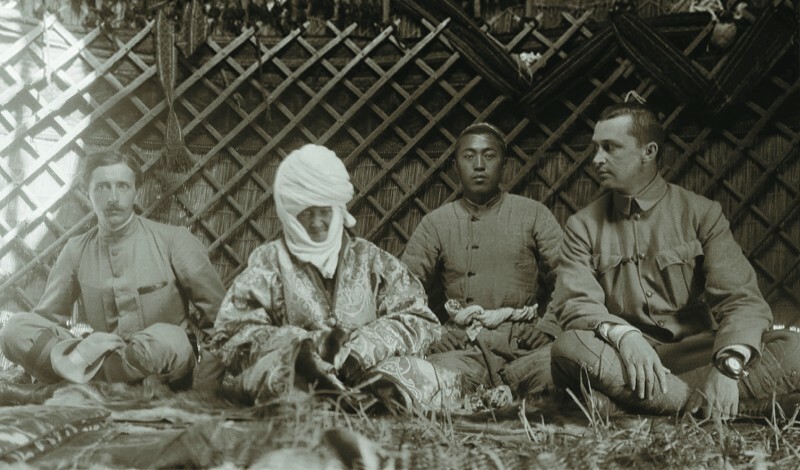 In 1906, Kurmanjan Datka (center) was visited by Baron Carl Gustaf Emil Mannerheim (right), a Russian officer traveling as an ethnographer from Russia to China via the Alai Mountains. When I found out several months ago about the upcoming release of "Kurmanjan Datka, Queen Of The Mountains," it was an exciting thought for me. Like most who have traveled around Kyrgyzstan, I have seen statues to Kurmanjan Datka and streets named after her. But I only got pieces of her story here and there while I was wandering around the country, so I still wonder who exactly was Kurmanjan Datka and how significant is she to the Kyrgyz today? Emily Canning's fine review of the movie includes a point I always felt keenly when she mentions a Kyrgyz girl who saw the film saying, "Other people wouldn't understand, but I feel this movie in my heart." Indeed. How could I understand? So I decided to contact someone who would understand and fortunately (very fortunately) for me I know Tynchtykbek Tchoroev (Chorotegin) who even among the Kyrgyz people is regarded as one of the leading sources of information about the nation and its history. And because I've known him for so long I'm going to call him "Tynch" throughout this article. After all of these years Tchoroev just doesn't sound right to me. He's Tynch. Tynch told me there were a few other female datkas ("datka" in Kyrgyz; "dadhoh" in Persian, means "righteous ruler") in the first half of the 19th century, but none who compared to Kurmanjan (1811–1907), the daughter of Mamatbay from the Kyrgyz tribe of Mungush, because only Kurmanjan's authority as a powerful local ruler in the Alai Mountains and surrounding areas was recognized by three nations -- Kokand, Bukhara, and Russia. She was given in marriage to a man she did not want and she fled back to her family. Such a thing is not heard of even today in the arranged marriages of people in the sedentary parts of Central Asia and in the 19th century it represented a major violation of patriarchal tradition, Tynch explains. Kurmanjan's decision to marry a man she loved was also not the custom, though in her case the affection was reciprocated by Alymbek Datka (1799-1862), the son of Asan-biy from the tribe of Bargy, a part of the Kyrgyz tribe of Adygene, whom she married in 1832. Tynch says Kurmanjan's stubbornness and insistence on marrying for love is "the main message of the life of Kurmanjan, a hero of freedom for the Kyrgyz women." Alymbek was a capable nobleman who supported the unity of the Kyrgyz people and independence of the Kokand Khanate from tsarist Russia. Alymbek Datka was the governor of the Andijon Province in the Kokand Khanate and the "atalyk" (regent) of the 12-year-old Shah Murad, the khan of Kokand (in 1862, just before his own assassination). After her powerful husband's assassination, Kurmanjan became datka, a transfer of power approved not only by the Kokand khan, who ruled lands that included Osh and Kurmanjan's homeland in the Alai Mountains, but also by Muzaffar, the emir of Bukhara, who temporarily ruled most of the Kokand Khanate during his invasion of this eastern Central Asian state. Muzaffar officially met with Kurmanjan Datka in the city of Osh, not in the Alai Mountains, as depicted in the film. Kurmanjan became, as Tynch says, "a kind of general on one hand, and on the other hand a governor." And it was a bad time to be either, for the Kokand Khanate was in decline and the Russian Army was making its way further into Central Asia. Kurmanjan's husband had fought against the tsar's advancing army and some of her children did also. For instance, Abdylda-Bek, the older son of Alymbek Datka and Kurmanjan Datka, was a leading commander of the army of "Pulat Khan" during the huge people's uprising against the advancing Russian regime. Pulat Khan was a Ferghana Kyrgyz mullah named Iskhak Asan-uulu, who led the last powerful uprising against both pro-Russian Khudayar Khan and the Russian colonial administration. Pulat Khan was executed by the Russians and Abdylda-Bek fled to Afghanistan via Pamir. He died in Afghanistan in 1877. But vastly outmatched, "Kurmanjan was wise enough to persuade the other Kyrgyz people not to fight against the very powerful Russian Army," Tynch notes. Kyrgyzstan is the only Central Asian country that has had a woman president, Roza Otunbaeva. As mentioned in Canning's film review, Kurmanjan did not fight to save her son from being executed by the Russians, according to some versions of Kurmanjan's story, she even attended the execution. She would not sacrifice the future of her people to save one of her offspring. That is another message from Kurmanjan Datka's life, Tynch says, that "her greatness was seen in the work for the interests of her people." As he says, "in the case of Kurmanjan, it's a reminder that a wife, a woman, could lead her nation." With all due respect to contemporary women in Asian politics such as Indira Ghandi, Benazir Bhutto, and Aung San Suu Kyi, Tynch adds that "Kurmanjan Datka was such a woman at the end of the 19th century." Tynch notes that while the Russians treated Kurmanjan with respect and even bestowed the title "tsaritsa Alaia" (queen of the Alai) on her, she was still "one of the tools to persuade the other Kyrgyz people in that region to live in peace within the framework of colonial Russia." But Kurmanjan was tolerant of different cultures, he adds, an important aspect since the area she lived in was and still is inhabited by scores of different peoples. The people of her day seemed to respect Kurmanjan Datka for this tolerance and her ability to govern, because records of her can be found "preserved in many manuscripts in Chagatai Turkic, Farsi (Persian), Kyrgyz, and other languages in Arabic script." One of the new legends about Kurmanjan Datka is the myth that she was writing poems in Persian and signing them with the name of Zinat. But Kyrgyz historians reject this, saying that Zinat was a male poet's pseudonym during the reign of Omar Khan in Kokand. In the film, Kurmanjan is shown writing in Orkhon-Yenissei runic-like script. Tynch points out that even though the Kyrgyz could write in the runic-like script in the seventh-12th centuries, that script was first deciphered by the Danish scholar Vilhelm Thomsen (1842-1927) in 1893. Kurmanjan Datka would not have been aware of the early medieval alphabet script of her ancestors. In 1906, Kurmanjan Datka was visited by Baron Carl Gustaf Emil Mannerheim, who was travelling as an ethnographer with the mission of a Russian secret intelligence officer from Russia to China via the Alai Mountains. Mannerheim, who eventually became the president of Finland (1944-46), took a unique photo of Kurmanjan Datka. Mannerheim's photo was used when a Kyrgyz banknote was designed with Kurmanjan Datka's portrait. The legacy of Kurmanjan Datka for the Kyrgyz people cannot be summed up in a few words or even many sentences, but if I could slip in my own comment I would point out that Kyrgyzstan is the only Central Asian country that has had a woman president, Roza Otunbaeva. And Otunbaeva set a precedent in Central Asia -- that hopefully will be followed in the future -- by leaving office when her term expired without even attempting to groom a successor or keep a role in politics. It is interesting to mention that in accordance with the decree signed by Otunbaeva on December 28, 2010, 2011 was declared the Year of Kurmanjan Datka in Kyrgyzstan in honor of the 200th anniversary of her birth. A woman of regal countenance galloping in slow motion across a verdant landscape. The cinematographer’s art of seduction reigns supreme. "Kurmanjan Datka: Queen of the Mountains" never fails to satisfy. Yet the Kyrgyz film’s greatest achievement is not simply serving as a welcome massage for eyes accustomed to a drabber three-dimensional world, but rather that "Kurmanjan Datka" actually consists of two films in one. On the one hand, there is the film that so impressed Hollywood actress Sharon Stone that she is employing her celebrity clout to promote the film, which is representing Kyrgyzstan in the Best Foreign Language Film category at this year's Academy Awards. But what she is endorsing is the version of the production that functions as a living, breathing “brand” for the nation to the outside world. But the film has another purpose: to foster ethno-nationalist sentiments for the sake of uniting a fractured state. Sultan Raev, a former Kyrgyz minister of culture, contributed to the screenplay, and a hefty amount of the film's $1.5 million budget -- a record for a Kyrgyz film -- came from public funds. The timing of the film's release is genius, for it brilliantly employs historical motifs for the purpose of molding moral actions in the political present. The drama opens in a serious tone, describing how although the Kyrgyz people had mighty beginnings, invading powers like the Mongols and Tamerlane drove them to the "verge of extinction.” Thus, we enter the historical present of the late 19th century at an equally fragile time for the Kyrgyz, who are portrayed as the semireluctant lackeys of the Kokand Khanate. Enter the Russians on the imperial scene, and it appears that between Kokand and the Kremlin, the Kyrgyz are in dire need of a hero. WATCH: The official trailer for "Kurmanjan Datka: Queen of the Mountains"
Kurmanjan Datka, a real historical figure known as the Tsaritsa of Alai, proves herself to be such a hero, though she was not born with this destiny in mind. She defies her arranged marriage and actively forges her own fate by aligning with a local leader for a scandalously successful self-made match. It is not until her clan is attacked that she is reborn as a queen, a development symbolized in the film by a newborn baby’s cry. She turns out to be a brilliant military strategist and public orator, delivering a patriotic speech inspiring her comrades not to “give land to the enemy” and to be willing to sacrifice their lives for the sake of their children’s happiness. Despite the fact that the movie describes the Kyrgyz as nearly facing “extinction,” she invokes the Kyrgyz epic hero Manas as a model and praises her people for having never conceded territory without a fight. Thus, we have a feminist warrior who would appeal to Sharon Stone, and a royal mother who is willing to make sacrifices for the greater good -- a moral model for other Kyrgyz to emulate. The concessions that Kurmanjan Datka must make are to the Russians, who she quickly realizes would annihilate her fragile Kyrgyz confederation. The climax of the film is when she allows her favorite son to be executed by the Russians in order to avoid future bloodbaths. This is when it becomes apparent that Kurmanjan is not just a mother but the founding mother of the Kyrgyz nation. While the movie deftly manages to elevate nationalist pride while conceding defeat to the Russian empire, the manner in which the occupation is portrayed is designed to erase the uncomfortable reality of structural inequality. For instance, language plays a pivotal role throughout the film as an index of Kyrgyz strength. When a Russian general comes to meet Kurmanjan Datka in her home, he immediately greets her with, in Kyrgyz, “Salamatsizby.” He engages in pleasantries in Kyrgyz as a gesture of respect, but then they proceed to discuss serious matters of the state in Russian -- a reality that is no doubt perpetuated in Bishkek today, despite the government’s best efforts to promote greater use of Kyrgyz. Later, the same general tells the queen that her Kyrgyz soldiers are of such high caliber that they serve as a model to the Russian soldiers. Such a level of respect shown by the Russians is ironic, given the recent reality of Russia’s behavior toward Central Asia and other Soviet satellite states. Russian President Vladimir Putin, for instance, recently insulted Kazakhs by declaring that their claim to ancient statehood is a historical fabrication. For Kyrgyz who are in a similarly awkward boat with regard to their own history, not only does this film “prove” that they have deep historical roots, it demonstrates that Russians do, in fact, respect their sovereignty. It is a kind of wish fulfillment for a country that relies heavily on sending migrant workers in Russia who, despite enduring hardships amid a tide of growing xenophobia, send remittances home to their families -- particularly in the south. The lush landscapes that showcase Kyrgyzstan’s greatest treasures -- from its pristine lakes to rugged red hills -- highlight the dual character of the film. On the one hand, it can be used to attract foreign tourism by highlighting the country's geographic riches, while the film's beauty also reifies the attachment of Kyrgyz to their own land. Bolstering such patriotism is crucial, especially when the government is funding the most expensive film in its history even as large swaths of the country remain without basic resources like gas or electricity. Kyrgyzstan’s “southern capital” of Osh has been without gas for more than half a year, and winter is nigh. The current levels of electricity will not be sufficient to sustain the heating and cooking needs of the most densely populated corner of the country. So far, the financial gamble has proved successful, as the film has moved audiences both in Kyrgyzstan and abroad. At a recent screening at the Harvard School of Law, the largely Central Asian audience offered lavish praise for the director, Sadyk Sher-Niyaz, and lead actress Elina Abai Kyzy, who were both in attendance. Despite attempts to prod Sher-Niyaz into discussing his film's geopolitical implications, he refused all attempts to read between the lines and insisted on the film’s complete historical fidelity. Speaking in Kyrgyz, what she meant was, non-Kyrgyz people would not experience the film at the same emotional level that she had. Nevertheless, the film has something for everyone because it fulfills our innermost longings: to flee to a far-off place of stunning beauty, or to find out that it was home all along. Emily Canning is a doctoral candidate at Brandeis University who is currently writing her dissertation on language and ethnic identity in southern Kyrgyzstan. She conducted 20 months of ethnographic fieldwork in Osh, which culminated in a Fulbright fellowship from August 2012 to June 2013.